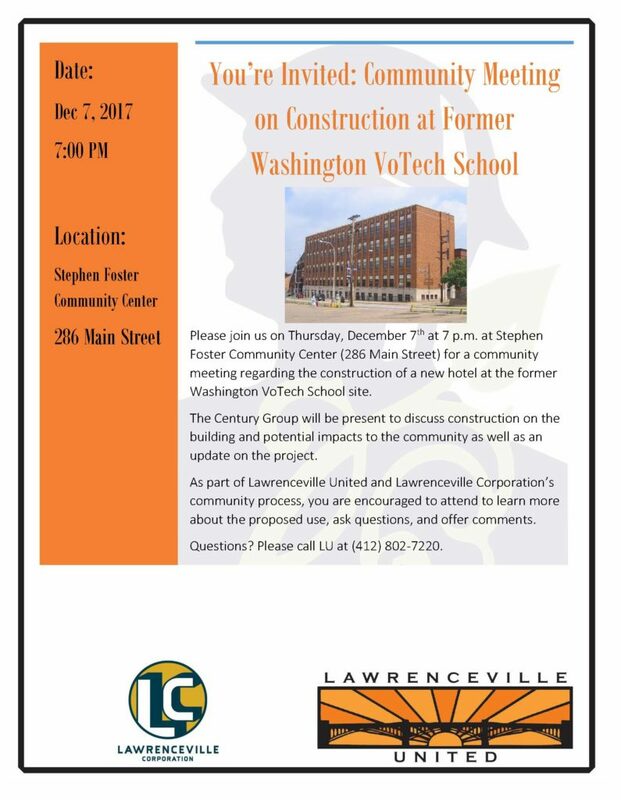 Please join us on Thursday, December 7th at 7 p.m. at Stephen Foster Community Center (286 Main Street) for a community meeting regarding the construction of a new hotel at the former Washington VoTech School site. 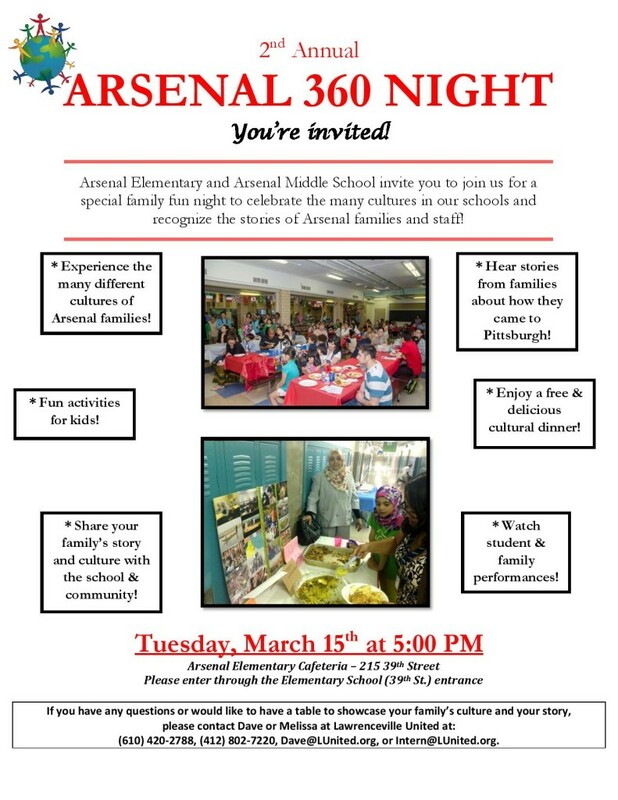 The Century Group will be present to discuss construction on the building and potential impacts to the community as well as an update on the project. 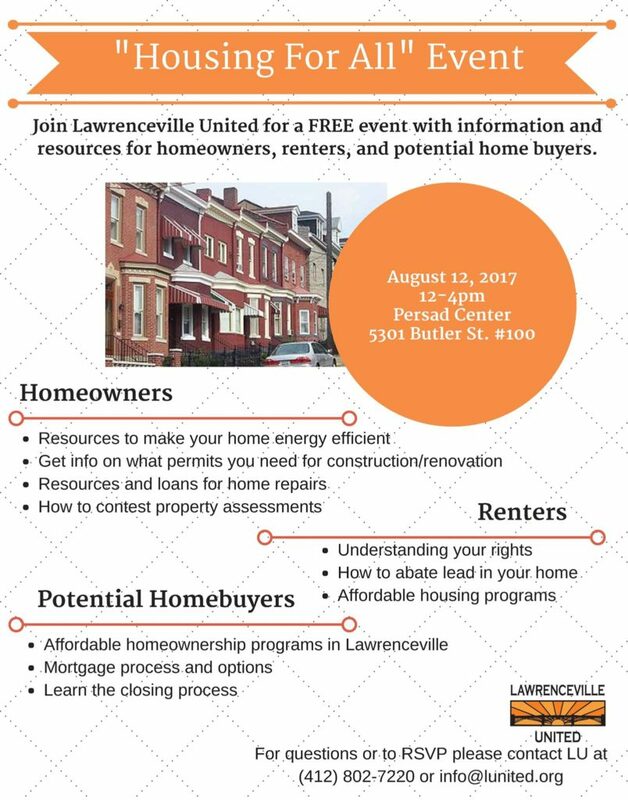 As part of Lawrenceville United and Lawrenceville Corporation’s community process, you are encouraged to attend to learn more about the proposed use, ask questions, and offer comments. 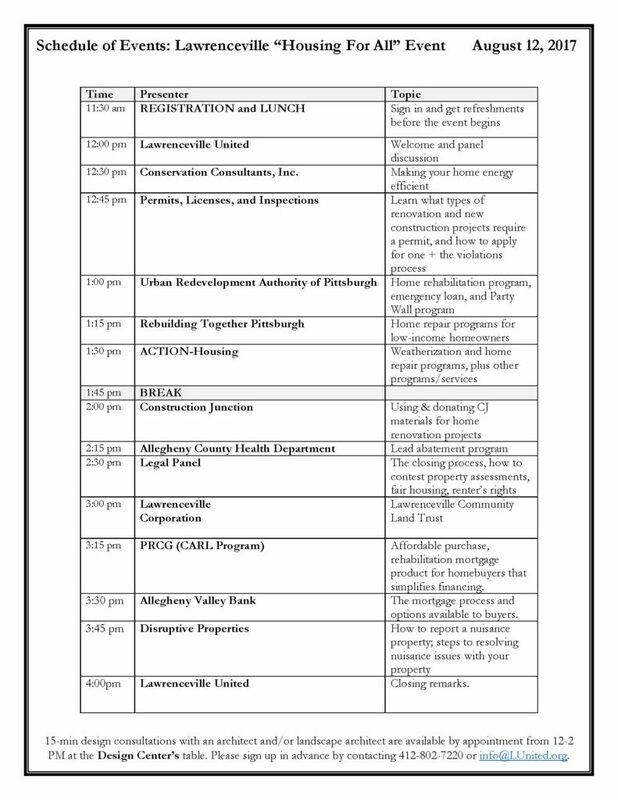 Please call LU at (412) 802-7220. 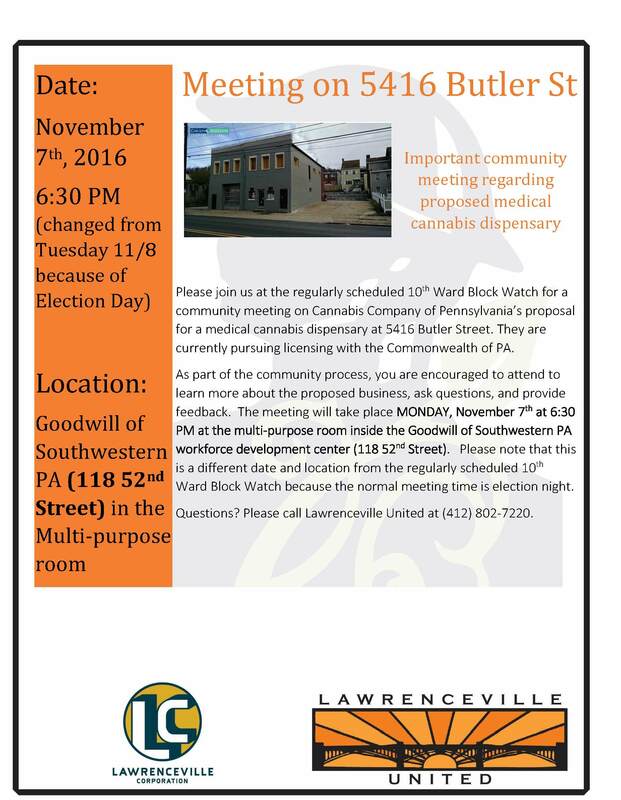 * DATE/LOCATION CHANGE FROM USUAL 10TH WARD BLOCK WATCH * Please join us for the 10th Ward Block Watch and a community meeting on Cannabis Company of Pennsylvania’s proposal for a medical cannabis dispensary at 5416 Butler Street. Monday, November 7th at 6:30 PM at the multi-purpose room inside the Goodwill of Southwestern PA’s workforce development center at 118 52nd Street. Please note that this is a change from the typical 10th Ward Block Watch meeting time/location because of election day. 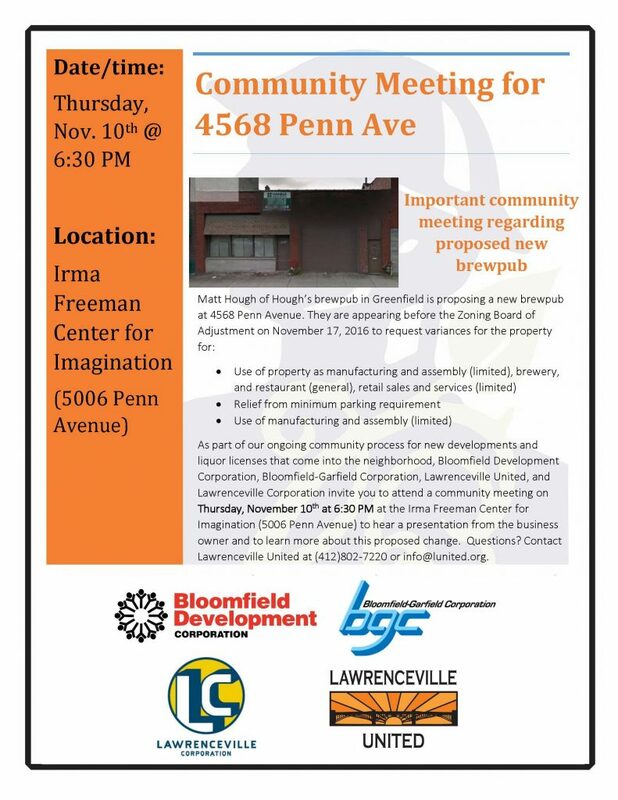 Please join us for a community meeting at 6:30 pm at the Irma Freeman Center for Imagination (5006 Penn Avenue) on Thursday, November 10th. Hough’s brewpub in Greenfield is proposing a new brewpub at 4568 Penn Avenue and will be presenting their plans. Food Pantry will move from St Augustine’s to St. Mary’s Lyceum for the next two years. Tickets must be bought in advance ($15) or day-of ($18) from Gallery on 43rd, City Grows, Dandelions, Coca Cafe and Pavement until 4:30 P.M. on Saturday, October 2. Restaurant (General) zoning is required for this location because the site will be renovated and an existing use will be changed to a commercial use. Any site plans in an LNC must be reviewed by the ZBA and an RG designation given for any new construction or building additions in an LNC zoned location. 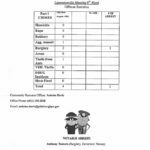 Liquor License: PA limited winery license, preliminary approval (pending inspection) obtained for satellite location at 3832 Penn Ave. Winery is currently located in Zelienople. There will be a covered awning with heaters for outdoor seating, so can use throughout the year. Q: Any zoning variances requested? Joe Talarico: Seeking zoning variance for second floor. Dave Breingan (LU): Some confusion about this. Square footage is still under 2,500 square feet, but received notice from Zoning Board that there would be a hearing. Need to follow up with zoning. Joe: Should be under the limits of the square footage. Isn’t making much sense. Joe: Initially, only open 5 days per week: Tuesday-Saturday. As business picks up and start hiring more people, probably will go 7 days per week. Open 11 AM to 8 PM Tu-Th, 11 AM to 11 PM on Friday & Saturday. Possible Sunday brunches once per month. Joe: January, hopefully. Still going through all the permits. Got held up closing on property and still waiting on building permit, which should be coming any day. Joe: Yes. Lots of grandkids and we want it to be a family place and kid-friendly. Q: Is there any off-street parking in the back? Joe: No room for parking anywhere. Parking is the one potential problem. Q: Parking is a major issue and something has to be done about. More businesses are coming in and not planning for parking. Dave: LU definitely recognizes this. Parking comes up at every community meeting. We’re working on solutions. Have some traction with a shared public/private parking structure on the site of the Arsenal Terminal development, which would provide some relief to the district. Looking at other solutions as well, but there are many obstacles around ownership issues and cost because parking is expensive. Follow-up question: What about zoning? How can restaurants keep opening when they’re not providing parking? Dave: The zoning code doesn’t require any parking for this project. Follow-up question: Has there been any discussion with Allegheny County Health Department about creating shared use agreement? Dave: Were some discussions with ACHD during Arsenal Park master planning about a shared use agreement for the parking, but need to revisit. Follow-up question: Does the city own parking garages? How are the other neighborhoods (Shadyside etc) able to get garages? Dave: Parking garages are very expensive and there’s been a reluctance politically to create them over other priorities. Follow-up question: What about permit parking? Dave: Can now protest to have residential permit parking up until midnight, where only enforcing it until 6 PM right now, when most of the parking issues residents are facing are later than that. Need a majority of signatures on your block to get residential permit parking. Follow-up question: What about offering incentives for residents who aren’t driving — providing discounts for residents? Dave: Senior AdvantAGE offers discounts for residents ages 55+ to get discounts at local businesses. Most owners are part of it. Joe: We’ll be taking part of it. Q: Commend you for providing living wage to employees. How to get other businesses to do this? A: In Seattle, see many restaurants doing this. Will it cost us some of our profits? Yes, but our workers are family. We want our employees to feel invested with us and I’m real confident it will work. I hope it will catch on with others. Zoning Requirements: ZBA hearing October 13 – Special Exception for office general and parking reduction to 12 spaces. Lot Size 10,460 sq ft.
Brian is resident of Lawrenceville in the 9th ward for thirteen years. Botero Development only does development in Lawrenceville, including Row House Cinema — which does offer discounts for residents. Have been working on 3700 Butler Street for a couple years now. Were initially planning on residential and retail on the ground floor, but times have changed: too much residential building in Lawrenceville now. Icon in the neighborhood and need to find a viable solution to redevelop it. Instead of adding more apartments, want to provide a place to work and more jobs for the community. We can’t be all residential — we also need jobs. Already received variance couple years ago for 4th floor addition with setback. Working with church parking lot behind the property for past 2 years — have tried to figure out a solution, but we can’t use it, so our solution is to put as many parking into the building as possible. Daytime parking is very different from nighttime parking. Want to cram as much parking as possible, but this means also losing valuable retail space that could be a nice amenity to the community, so trying to balance out those two conflicting ideas to provide as much parking while still providing retail there. Historic renovation is our bread and butter and that’s what this is about: want it to be beautiful and grand. Originally built by Ford Motor Company — built car parts there. Has a cool history and is built like a tank — want to make sure the story we add on doesn’t interfere with the historic view of the building. Going to do office: high-tech (e.g. small design firms), trying to capture the jobs of the people who are moving into new residential units, as well as office shares. Feel like the neighborhood is lacking this right now. Entrance will be on Ater Way. Currently a dingy alley — want to spruce up the alley and make it more attractive. Planning on investing in it. On the Board of Bike Pittsburgh. Putting in the lease that tenants are required to be a Bike Pittsburgh Gold Member and participate in Port Authority Perks program (get your bus pass through your employer and get a significant discount). Retail: no idea what it’s going to be. Not talking about this today. Will remain “white box”: if any business wants to come in here in the future, they will have to go through their own zoning process. The businesses I bring in are always local and it’s important to me that they serve the neighborhood. Parking: required to provide 30 parking spaces, based off the potential employees. We’re only able to provide 12 because the building takes up the whole lot and there’s only so many spots we can fit in the building b/c of the shape of the building. Worked for 2 years with the Catholic church to add a parking deck, but at the end of the day, it didn’t work and we had to rethink it. This is daytime parking and will be daytime users, which should be minimal impact to the neighborhood since they’ll be parking in Lawrenceville while we’re all at work. Further, we want to be a part of any solutions around parking structures (e.g. Arsenal Terminal) and lease spaces to expand our parking. Two zoning variances: special exception for office general (currently industrial use), and parking variance. 1 parking space will be van-accessible handicap space. Q: Glad to hear that something’s being done with that building. It’s been an eyesore for a long time. Brian: First building that caught my eye 13 years ago — very exciting to be here today. Q: How are you going to control if someone like Uber or Google rents a space with you and those individuals don’t live in Lawrenceville? Brian: I can’t control where people who work there live, but what we’re going to do is to make it as convenient as possible for employees to get to work without taking a car. Follow-up question: So you’ll be discriminating about your tenant? Brian: We would thoroughly vet who we would sign a lease with. It’s a business arrangement for many years, so you have to be proud to do business with them. The businesses we’ve brought into the neighborhood are Wild Card, Row House, Bierport, Smoke, landlord for Bike Pittsburgh, and that I think demonstrates that we have a good past in terms of who we want to do business with. Q: We were talking about the parking requirement for the pizza shop earlier. I am concerned about the fact that you’re asking for a parking variance. You’re providing 1/3 of the parking that the project should have. The pizza shop is a drop in the bucket compared to this. Brian: I think the parking that’s creating concerns from residents is the nighttime uses. What’s good about this is this is daytime parking, and 38th Street is mostly empty during the day. Follow-up question: I agree with you, but you’re not dealing with the first floor since it’s “white box”. The first floor could have an additional 10-40 parking spaces if you have restaurants. Brian: We’re not going after restaurants and we’re not going to build a ventilation shaft. Our goal is to do more neighborhood service. Personally, I would love an ice cream store, like a FroYo or more traditional ice cream shop. A few businesses that already exist in Lawrenceville are looking to expand and we’ve been in conversations with them. Follow-up q: And why aren’t you providing more parking on the second floor? Brian: This building was built for an automobile company and there’s a ramp that goes from the 1st floor to the 2nd, but wouldn’t pass code today because it’s too steep. The 2nd floor is the prime office space, and if we took it out for more parking, the project wouldn’t work financially. The whole purpose of the project is to provide office space, and if we can’t provide office space because we’re providing parking, it defeats the whole purpose. Q: Where does the parking pull in? Brian: About middle of the building on 37th Street. There would be a curb cut and a slight ramp down. Follow-up q: You wouldn’t see from Butler Street? Brian: Correct. From a Butler Street perspective, it looks good and looks like retail like it’s supposed to. And the back half would be hidden from the church as well. Keeps Butler Street entact. Q: I agree we desperately need to get this building redeveloped. Would you be willing to write into your zoning that you’re not going to put a restaurant here, which would be the main creator of a parking issue? Brian: What I think we could say is we’re not going to have a shaft, which would restrict what kinds of uses could be there. A hood has to go through the building to the roof — without that, it limits what kinds of dining you can have. You could have a frozen yogurt place or a deli (like Butler on Deli, which doesn’t have a hood), but it limits the kind of restaurant you could have there. Q: When is zoning hearing? Brian: October 13th @ 10:40 AM. After we got through zoning, we would hopefully get a permit by next summer. Q: The building is not currently on the historic register? Brian: There is no historic register for Lawrenceville yet. Our plan is to go after 10% historic tax credit since the project is all commercial, where we don’t have to put it on the register. 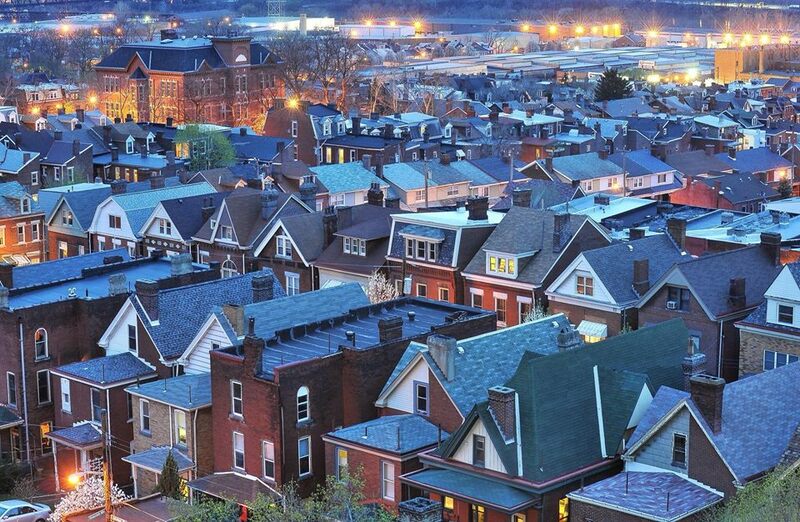 If the neighborhood does become a national register, then we’d go for that. The limitations for the 20% provide a lot of rules, but the 10% we’re not obliged to as many rules. These are federal dollars that go to renovating historic buildings. 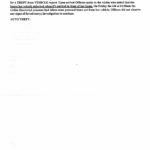 Pittsburgh Bureau of Police just released the offense statistics from July 16th through August 16th in the 9th Ward. 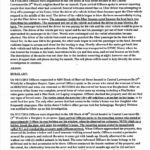 Click on the images below to view them. 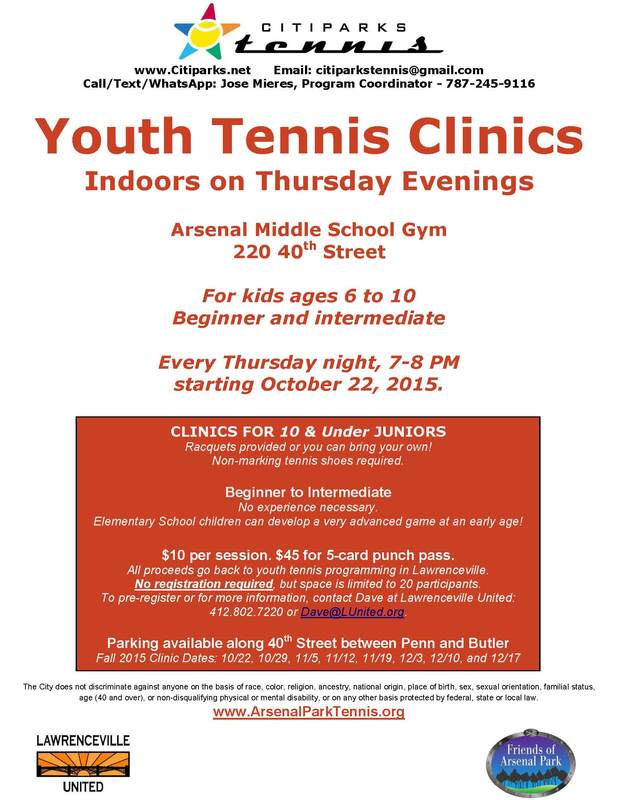 Youth Tennis Clinics are Back! 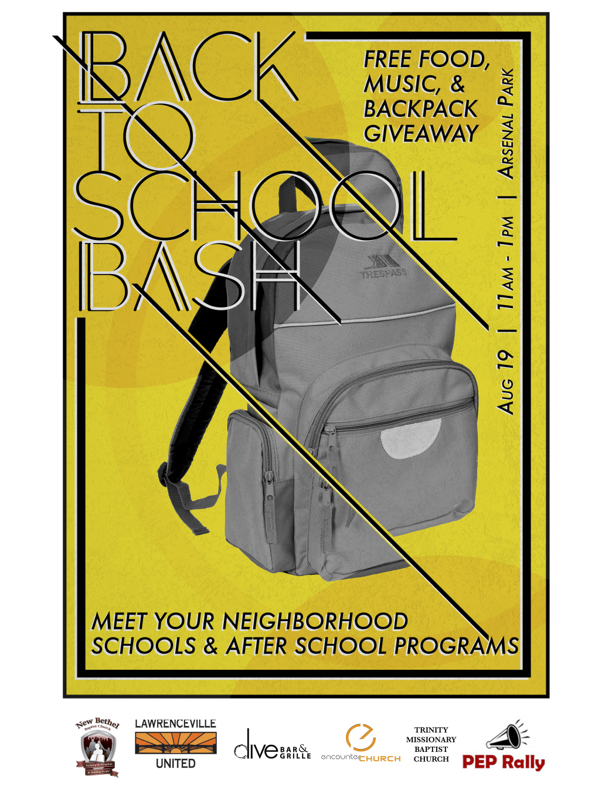 Please RSVP to Dave at Dave@LUnited.org or 412.802.7220.